Quentin Tarantino has settled into his groove and is polishing his craft. 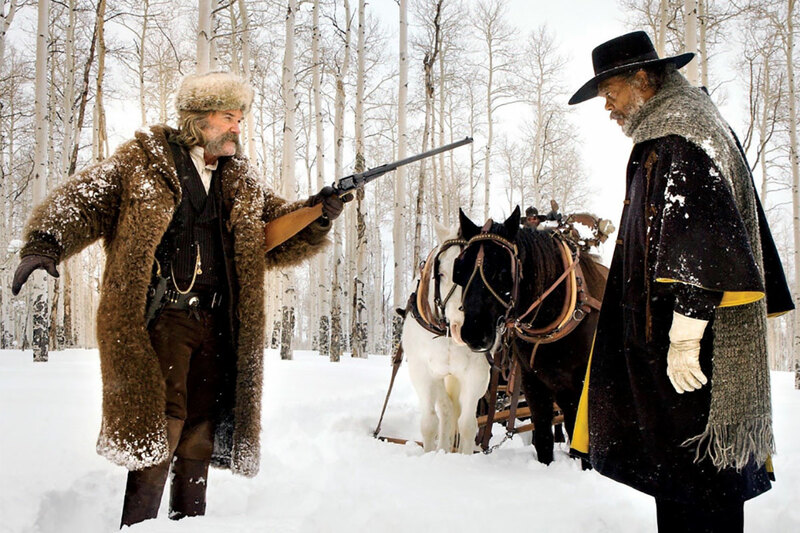 His latest production, “The Hateful Eight,” is very Tarantino. There’s plenty of graphic violence, humorous and profane dialog, and a general sense of over-the-top-ness. He seems to get a real charge out of having his actors use racial slurs which, while they are context-appropriate, is a bit grating. What “The Hateful Eight” does have in spades is thoughtful, unhurried cinematography, and carefully-paced sequences of dialog that are somehow just as intense and suspenseful as a prolonged action sequence would be. The story is set some years after the Civil War. Bounty hunter John Ruth (Kurt Russell) is trying to take his latest catch, Daisy Domergue (Jennifer Jason Leigh), to the town of Red Rock to face a murder charge and almost certainly hang. On the way, he meets fellow bounty hunter Marquis Warren (Samuel L. Jackson) and Chris Mannix (Walton Goggins), who claims to be Red Rock’s new sherriff. A blizzard forces them to stop early at a small establishment everybody in the area knows. But something is off. The people there are all unknown to Ruth, and their explanations for why the proprietors aren’t around are suspicious. The rest of the film takes place inside the building, almost entirely in the single large room that holds a bar, dining table, and small shop. That things are more complex than they seem is something to take for granted with a Tarantino film, and he does not let us down here. The pressure-cooker fueled by racism, Confederate pride, and the capacity for violence simmers for a bit before things begin to crack. The acting, as one might expect with this cast, is fantastic. Jackson is a master scenery-chewer, and nobody writes for him quite like Tarantino. Tim Roth is likewise perfectly written-for, and both he and his character are having an almost unseemly amount of fun with the whole proceedings. The cinematography, full of icy cold whites and blues outdoors and hot reds and browns inside, is impressive. Tarantino does everything in a highly-stylized way, and he bites into the Western genre with the same enthusiasm as his other films. Every knob is dialed to eleven, then past it until it breaks off. You probably already know if you like Tarantino’s films. They have a consistent, if evolving, style (with the exception of “Jackie Brown,” one of his less-popular films), and you either like it or you don’t. “The Hateful Eight” is in some ways a bit slower than his other films, but not by much. Plan for a long time in your seat (runtime is nearly three hours), because if you dig Tarantino, you won’t want to leave it.